This full-day private tour takes you to the famous Hindu water temples of Bali. See the iconic Pura Tanah Lot, Bali’s most photographed temple, situated in the midst of the Indian Ocean. You’ll also visit Pura Ulun Danu Bratan, with majestic views of its namesake lake, and Taman Ayun Temple, whose royal grounds date back to the 17th century. Hear fascinating commentary from your own personal guide along the way. The visit to the water temples in Bali was a memorable experience and I highly recommend this trip to anyone going to Bali. Our tour guide Krisna was an awesome guy and his talent for languages is unbelievable. We enjoyed the visit to the temples. Thank you Krisna for the memorable experience. The tour guide was good and knowledgable, informative, spoke good English/was easy to understand. Vehicle was spacious air conditioned. Where this started to fall down was the content of the tour compared to the cost. We were given options of what to avoid and see instead but that meant the tour finished early missing the sunset Home by 4pm which in hindsight we felt misled about. We were rushed- told we were on a tight schedule which made it less enjoyable for us. We had to pay for the buffet at lunch which had uncovered food and plenty of flies- although they did cater for the vegetarian. Compared to the Ubud All Day Tour at 13 each this was substandard and well overpriced. We had a blast learning all about the culture in Bali! Tirta was our tour guide and was absolutely fantastic! I highly recommend? Speaks very good English and gave us more information then I ever could have imagined. Scenery was gorgeous, highly recommend! Tour guides Sam and Wayan were very lovely and helpful. Happy to answer any questions. The drive between the second and third temples was long due to traffic, but lovely scenery to view. We loved the Temple tours, they were filled rich history. Our guide was very knowledgeable and spoke great English. The only downfall was it was extremely crowded with tourist and the tour was not very eventful compared to the other tours that we did. This was a great tour and our guide was amazing! He was very knowledgable about each location as well as the local customs. The only thing I would caution people on this tour is ... it is a long one and be prepared to sit in the car A LOT! I would also say to do the Tanah Lot tour first as recommended by our tour guide as due to the crowds during this time of year it is nearly impossible to visit as the last one. We did Tanah Lot, then Ulun Danu and finally Taman Ayun. Like another person reviewed previously ... another issue would be lunch or eating. Due to the severe time constraints on this tour I felt rushed at the temples ... this leave no room for lunch. We had to buy cup of noodles and eat in the van to have any chance of eating. Something else I would caution on is we went over Christmas Dec 24th and was told this was the major time of year for everyone to come to these temples and pray ... I am literally not hyping this up, but the traffic coming to these temples was HOURS and HOURS long due to all the people. We were fortunate enough to miss the busy periods due to the temple selections and made it without waiting hours ... but make sure to consider this when choosing this tour. I think that the tour was till very amazing and great knowledge from our guide, but I cannot give it the highest rating due to the time constraints and the whole lunch/eating deal. I also would like to see a little more interaction from the driver ... he barely said 2 words to us during the entire trip. 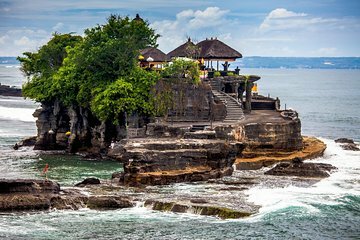 Tanah Lot and Ulun Danu and their surroundings are great places to see. Our guide Usman was very knowledgeable, he provided us with very good insight of Bali culture. These temples are definitely worth the trek, even the long drive from Kuta or Denespar. They're so beautiful that they can be appreciated without a guide, which was good because while our guide had a few introductory facts to offer us, he was able to answer virtually none of our questions either due to a lack of knowledge or insufficient English. Particularly problematic was the complete failure regarding lunch. Wanting to avoid another tourist-trap buffet, we researched in advance and found a well-reviewed restaurant about 30 minutes from Ulun Danu Beratan. The guide and driver refused to take us there on the grounds that their 10-seat van couldn't fit on the roads. We accepted their claim and told them we would be happy to eat at any restaurant that didn't have a buffet. They took us to three restaurants that each had a buffet and dozens of 1-star reviews on TripAdvisor. We declined to eat at any of the three and thus never ate lunch. After we returned to our hotel in Seminyak, we found a photo that showed a full-size 40-person bus parked in front of the supposedly inaccessible restaurant, thus proving that the reason for denying our request had been dishonest. Rena was an amazing tour guide! We loved chatting with her and learning all about the Balinese people, in addition to the wealth of knowledge she provided on the destinations. Would recommend!